No, that is not Jared Lorenzen. 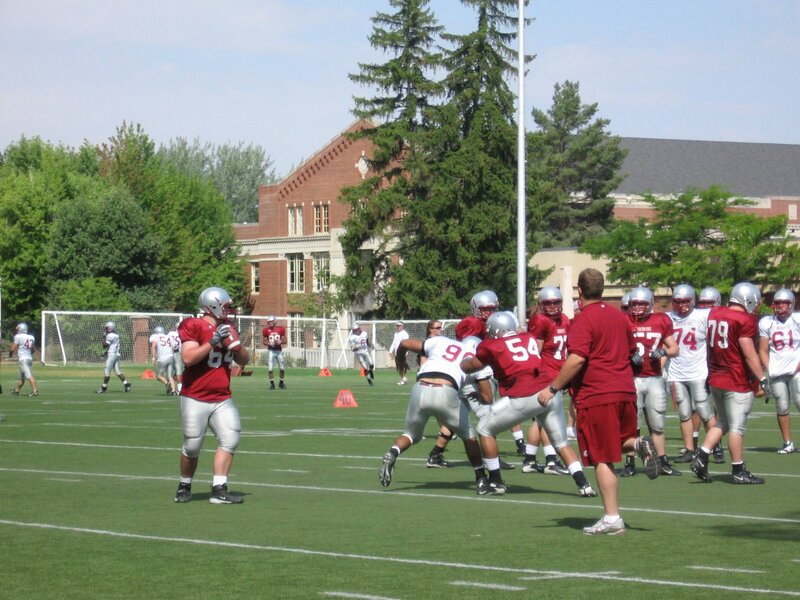 That is Kevin Farmer, a 6’4″ 299 lb freshman O lineman standing in at QB during pass rushing drills this summer (notice, none of our D-linemen are getting anywhere near him). We might as well, right? I mean we clearly aren’t going to ask our QBs to throw and if he still gets hit, at least the big fella should be able to give as good as he gets. And look at that footwork! Eyes down field, standing tall in the pocket… Looks good to me. Allright, enough funny business. I wanted to chime in with my 2 cents about the mind blowing catastrophe that is the 2008 Cougar Football season. The streak died. And it died without us making any kind of serious attempt to keep it alive. Like many of you, I was beside myself with rage/grief/humilation, you name it. However, unlike many of you I am in no way even close to condemning CPW and his staff. Now I will admit, that is the first time I can ever recall seeing my beloved Cougs not actually try to win a game. At all. That is painful, and certainly not fair to anyone who paid to attend the debacle. I think it was a mistake on the part of this staff not to attempt to compete, and I expect they are learning a tough lesson from being raked over the coals for it all week. But Cougar Nation, I implore you to keep in mind as you judge the decisions that this staff is making, there is not a single option available to them week in and week out that they actually want. They cannot run the defense they want, and they cannot run the offense they want. The only options available to them due to personnel issues are not what they would ever choose if they didnt have to. Making all the right decisions in a circumstance like that is not possible, and making decisions that are popular with the fan base? Forget about it. Now for those of you questioning coach Wulff’s qualifications, I want to get something straight. Eastern Washington is not a Division II school. It is a Div 1AA school, and there is a difference. In fact, in all of football there are no two closer divisions than Div 1 and Div 1AA. So close in fact, that they actually PLAY EACH OTHER. If you don’t think that coaching success at Div 1AA translates to Div 1, you are simply not a knowledgeble football fan, so luckily for you, I am here to set you straight. Or better yet, go check out Joe Cline’s article on Cougfan. I’ll be waiting here for you to come back and explain to me how all those other “Div II” coaches like Jim Tressel, Dennis Erickson, Mike Price, Rich Rodriguez, Frank Beamer, etc. were all overwhelmed by the bright lights of D-1. The fact is there is no other more dependable proving ground for successful Div-1 coaches than Div-1AA. If any group of coaches has ever proven to be “in over their head”, it is the career assistants like, ahem, Doba. CPW has proven at a high level that he can succeed against competition that has greater resources. He also has unquestionable loyalty to WSU and can refer to this as his “dream job” without a hint of B.S. That is a great recipe for sustained success on the Palouse. If you have been a Coug fan since before 10 win seasons were even considered a possibility, when the Jackie Sherrils and Dennis Ericksons of the world used us as nothing more than a rung in their career ladder, you know exactly what I’m talking about. Today coach Wulff and his staff took a timeout from being all overwhelmed by Div 1 to land yet another verbal commit from a kid that other Pac-10 schools were after. You are currently browsing the archives for the Div-1AA category.